Dogs and humans have been companions for a long time. There is a burial site in Israel carbon dated to 12,000 years ago with a body of a woman and her puppy. Some scientists believe humans and dogs/wolves have been associated for as long as 100,000 years. The oldest dog-like fossil we know of comes from Europe. 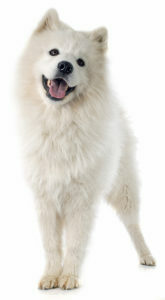 It was earlier believed that dogs originated in East Asia and the Middle East, but a newer DNA study points to Europe. This study gathered DNA from fossils of 18 ancient finds in Argentina, Belgium, Germany, Russia, Switzerland, and the USA. The genetic material was compared to samples from wolves, 77 different dog breeds, and several coyotes. The DNA similarities to European wolves doesn’t mean Europe is the only place where dogs developed – species migrate, the planet changes, and a parallel development might have taken place in other parts of the world. But, it is the best we know right now.